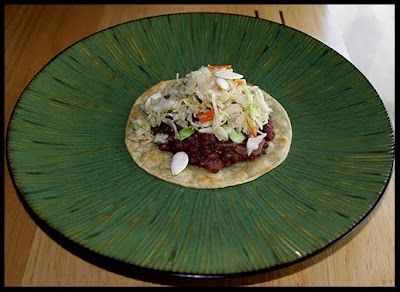 These tostadas were inspired by Bon Appetit's Crispy Black Bean Tacos. I followed the recipe fairly closely, leaving out the cilantro and feta cheese. To make the tostadas, I pan-fried corn tortillas in really hot oil just until they were lightly browned and starting to get crisp. I added some roasted pumpkin seeds on top for a bit of salty crunch. The tostadas were delicious, and we both loved the cabbage on top. Hi Michele! Hope you're feeling better. 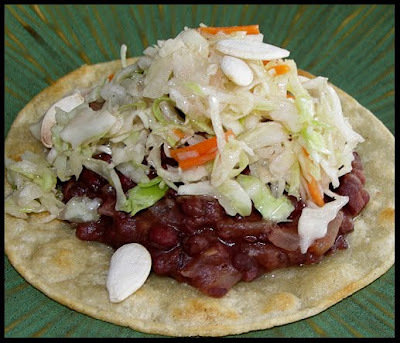 I love tostadas, and your black bean ones look delicious. Even when you're not feeling well you make the most amazing dishes! I love the leftover pasta frittata and the orange-mint (or was it chocolate-mint?) tea is simply lovely. I have orange mint growing out back, which I have used in iced-tea, too. YUM. I love eating and making tostadas. Great choice. I hope you are doing better. mmmmm - those look great. But cilantro - one must put cilantro into a tostada!! That looks really delicious! I'm always looking for veggie recipes. Tostadas are sooo good.